1Choose the Banking→Make Deposits command. 2Use the Payments to Deposit dialog box to select the payments you want to deposit. You can select all the payments listed by clicking the Select All button. You can select individual payments by clicking them. QuickBooks marks selected payments with a check mark. 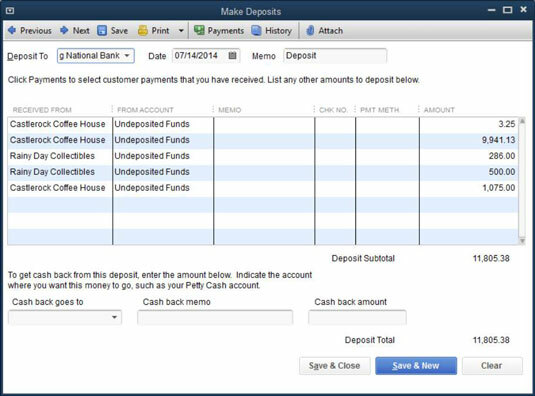 QuickBooks displays the Make Deposits window. Use the Deposit To drop-down list to identify the bank account into which you’re depositing the funds. 4Use the Date box to identify the deposit date. You can enter the date in mm/dd/yyyy fashion, or you can click the small calendar button to the right of the Date field. On the calendar that appears, click the day that you want the Date field to show. 5(Optional) Provide a memo description. 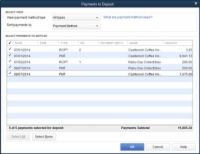 Initially, QuickBooks uses the Memo field to describe the transaction as a deposit. This is, obviously, a pretty good description of a deposit transaction. If you want to change the memo description to something else even more useful — such as daily cash sales or something like that — replace the contents of the Memo box. 6Record any additional deposit amounts. If you want to include as part of the deposit some other payment that’s not listed initially in the Make Deposits window, you can use the next empty row of the list to describe this payment. To describe the payment, use the Received From column to identify the customer, vendor, or other individual or business making the payment. Use the From Account column to identify the account that should be credited for this payment. In the case of a customer payment that’s a sale, for example, your sales revenue account should be the one recorded in the From Account column. Use the other columns of the Make Deposits window — Memo, Chk No., Pmt Meth., Class, and Amount — to provide the other details of the payment. If you’re making a $1,000 deposit but want to hold $100 of the deposit back as cash, you record a cash-back amount. To record a cash-back amount, use the Cash Back Goes To drop-down list to identify the account that should be adjusted for the cash back. Use the Cash Back Memo field to describe the reason for the cash-back transaction. Finally, enter the cash-back amount in the cleverly titled Cash Back Amount box. For example, if you want to hold $100 of cash back for employee bonuses, you may enter employee bonuses (suppose that this is an expense account) in the Cash Back Goes To box. Then you may use the Cash Back Memo field to describe the occasion for these employee bonuses. Finally, you enter the cash-back amount, $100, in the Cash Back Amount box. As is the case with other QuickBooks transaction-entry windows, click either the Save & Close or the Save & New button to save your deposit transaction. Note that after you’ve saved the deposit transaction, QuickBooks records the deposit in the appropriate bank account. This deposit transaction total — which appears in the Deposit Total field at the bottom of the window — is the amount that appears in your bank statement. It’s also the amount that appears in the bank account register. The Make Deposits window also provides Previous and Next buttons that enable you to page back and forth through your deposit transactions. The Print button in the Make Deposits window lets you print a deposit list. 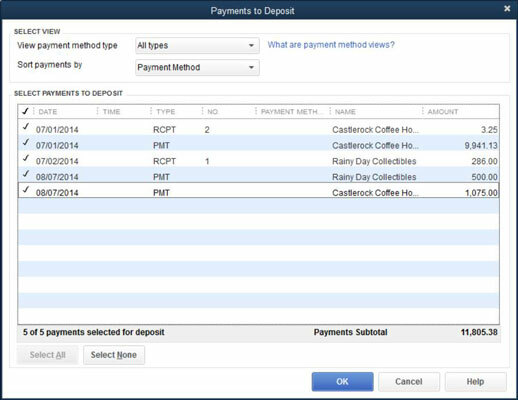 The Payments button lets you redisplay the Payments to Deposit dialog box. The History button lets you display a transaction history for the selected payment. Finally, the Attach button opens a dialog box that you can use to attach a document (such as a PDF image of a check) to the deposit.